This is part 1 and for part 2 see here. 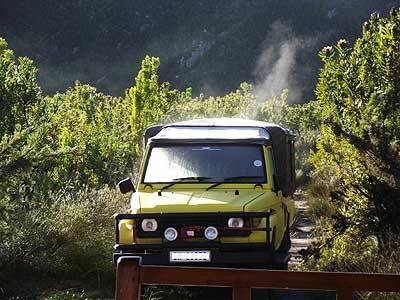 The South African practice of bundu bashing involves pitting yourself and your vehicle against extreme wilderness situations. This usually involves a 4 x 4! Preferably a good one. It’s an addictive pleasure, getting off the beaten track. Hungry for some wide-open spaces, we took our beloved ‘cruiser, star of so many escapades, and went to visit friends, D and P, in their Outeniqua hideaway. This mountain refuge ticks all the right boxes. It’s a gorgeous place; inaccessible, wild, remote and so worth a visit. 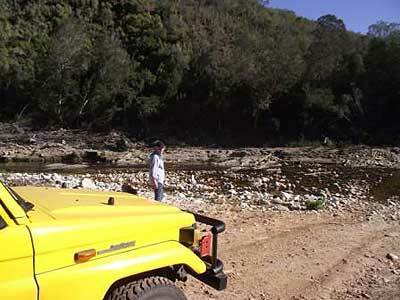 You may have driven past the turn off more than once, on your way to visit more tame delights along the Garden Route. 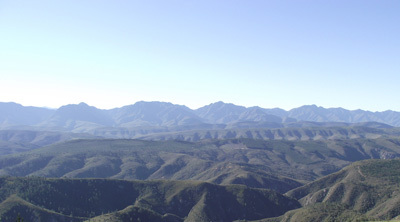 Certainly then, you’ll never know what bundu bashing opportunities lie in those shimmering blue-grey mountains. 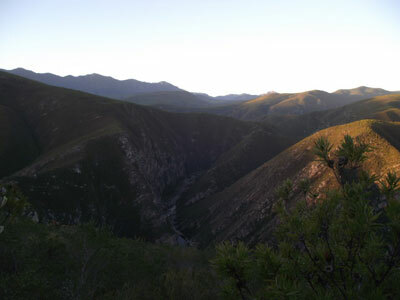 The name, Outeniqua, is said to come from the Khoisan tribe that once lived in these mountains and means “they who bear honey”. Forgetting it’s winter in the mountains (snow), forgetting we’re going to be stepping back in time (think no mobile phones or electricity), forgetting that once you leave the dirt road, it’s a minimum of three hours driving on what can only be described as rocky mule tracks; we went deep into the wild Outeniqua Mountain range, behind Plettenberg Bay. An epic journey if you get it all right and get where you want to be…but, with no map and no known destination (no coordinates, no GPS), we got lost… horribly lost. This, of course, is my opinion but M, being a pilot, claims categorically that he was, “only temporarily unsure of his present position”. Lost… Deep in the Mountains, the freezing winter night swiftly closing in, huge trees looming overhead, obscuring the last pale rays of the dying sun… We had been bundu bashing, up and down mountains, crisscrossing tracks everywhere, with potholed logging tracks turned to marsh by huge puddles of rainwater and snow melt (yes, this is Africa and in the mountains, it snows here). But the last logging truck had passed us over an hour ago, packed with tired workers obviously heading home. Communication had proved difficult when we discovered that our mobile phones would only work at certain elevations and in the absence of the aforementioned, huge trees! Our host knew we had crossed the first river just after noon and had been quick to reassure M that only another hour would see us there. More than once, in an afternoon that is infamous in our memories, we debated aborting the whole excursion and heading back to civilization, a hot shower and a warm B & B. That was while we still had a rough idea of which way civilization lay. Now, time was running out and with it, our options. The wilderness we had plunged into, a few short hours ago, had morphed into a spaghetti bowl of muddy trails in a tangled mass of undergrowth, overgrowth and stones… very muddy stones. The darker it got, the harder it was to pick out where a trail ended and a just-felled patch of timber started. More than once the ‘cruiser had to pick her way over branches and rocks (classic bundu bashing) or bypass a whole tree left lying across the hint of truck tires that signified a track. Adventure is awesome, keeps you on your toes, extra adrenaline is good for the metabolism and with these cheerful thoughts in mind; I hopped out to open yet another gate. The lights of the ‘cruiser picked out the rocky road, the trees and growth making a corridor up the hill but all the detail, left and right, was veiled in darkness. Quite cozy really, down below me somewhere I could hear the rushing water of an unseen stream and the soft “thrum” of the engine next to me. As I closed the gate, that cozy darkness enveloping me exploded with sound! Roaring, barking, howling sounds! Arrrrrggggh… Help! It took a lifetime to cover the distance between the back of the vehicle and the cab. Shaking with fright and shock, M nearly had me in his lap but then I realized he was shaking too… with laughter! We had inadvertently disturbed a troop of Chacma baboons settled in the trees for the night and they were scaring us off. They use this technique to get rid of hungry leopards so why not lost people? 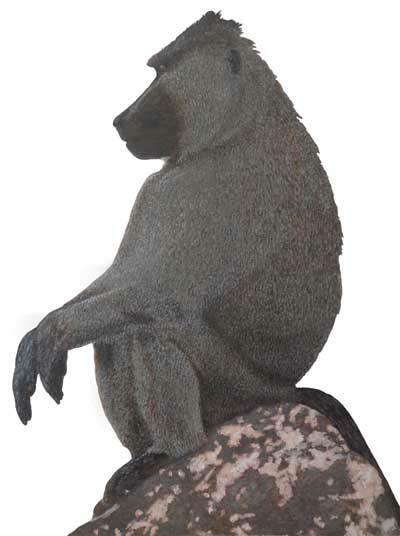 The Chacma baboon with a body length of up to 115 cm and a weight from 15 to 31 kg is among the largest and heaviest baboon species. Males can have canine teeth as long as 2 inches and more, even longer than a lion’s canine teeth. They are awesome predators – just think, four hands and all those teeth. Many a leopard has regretted their choice for dinner. This was sooooo not funny! And I got such a fright, and got laughed at too, with my – now cold – wet feet. What? Check for puddles? Me, when there are giant lion-type Apes around? I was cold and miserable. Not a happy camper, no Sirree… There may even have been some eye-water involved! Whatever, – and here we should cue stirring music – when I stopped hyperventilating long enough to look around; the road ahead now winding up the mountainside seemed more open, definitely fewer trees and less overgrowth. Out here, in the open as we climbed, the sky still held remnants of the day and in the twilight, we could sort of get our bearings. This was a better road – no gates – than the one we had just left and as we crested the peak, we could see the glow of Plettenberg Bays’ lights over the mountains somewhere far away to the south. But, joy of joy… suddenly our mobile phones came alive. Having been dead for the last few hours we had been trapped in the forests; but out here in the open, we had a signal. D came to meet us – how, I don’t know – but somehow he and M worked out where we had ended up. I think it helped for them both to have grown up in bush country. “Two tracks crossing in the middle of a small stand of pines?” Check. “Did we pass a large bit of earth-moving equipment on the left, just before the trees?” Check. “One corner fenced off with a five-strand wire fence? Check. “Carry on up that track, don’t turn off, keep going, I’ll meet you along there,” and he did! But it took him, (coming from the opposite direction) over an hour to reach us and then, convoy style with the 4 x 4’s; it took another hour to get to the house. There, with P’s great food and plenty of soothing beverages, (some wine may have been involved); the rigors of the trip were soon forgotten. It came to pass that D & P had not left their mountain utopia since before the weather had set in and had no notion of conditions in the muddy, swampy valleys between them and the rest of the world. We had spent over nine hours covering the 38 miles (62 km) of Outeniqua Mountain tracks, from Plettenberg Bay to D & P’s house. A potholed and water logged tar road for three and a half miles, nineteen and a half miles of forestry dirt road. Potholes? Naturally! Forestry then having been left behind us, we began to climb and climb, finishing up with fifteen miles of high altitude mud and rock trails, to reach our destination. At times, we were traveling way slower than we could have walked… but what a journey! The Amazing Patchwork, Gingerbread House. Perhaps, I’d better explain… here there was nothing! A house, yes, but no jolly little village. Plettenberg Bay was the last town, the closest town and that was thirty-eight miles away. In the immediate area, nothing! No people, no cars, no doctor, no corner shop, no fire department; nearest absentee neighbor, about three miles “as the crow flies”. What is there, is an enormous and unending silence and hidden away in all this huge emptiness, everything we’d come to see. D’s been building this nest on this 1000 hectare wilderness of his, by hand for a few years now, helped only by his one son. While he was slogging away in the bundu here, P was keeping the home fires burning, closer to civilization until 2010, when she joined them. Another year or so and it should be finished, along with another project for this bit of natural mountain fynbos. The family’s devotion to these dreams of theirs is total. This hand-hewn local forestry log home, has grown organically and sprawls along a ridge of highland, an Afro/Euro fairy-tale on a mountain in the Cape. Arriving in the dark with no artificial lights outside; headlights and starlight revealed what little we could see of the home where we would be staying. With the exterior giving nothing away, we went into a huge great room, stone floors, wooden walls; the glow from a Chimenea adding its amber warmth to the candlelight. Later gathered around the old table, warm and well fed, the muddy valleys seemed very far away. Clear skies the next morning meant daylight came early to the high mountain. Happy birds celebrated the morning. Our ‘cruiser was covered with frost, but no worse for wear from her bundu bashing adventure, except for the driver side mirror bracket and M said he had a spare. Seeing the ‘cruiser, with the thick frost all over her canvas roof, had me grateful for our warm bed. What a frightful thought, we could have spent the night out in the bush! Eish, it would have been very, very cold. And then there were the baboons (and the leopards)! Stepping out of the warm house early that morning, into the cold, brittle light was stepping back in time. 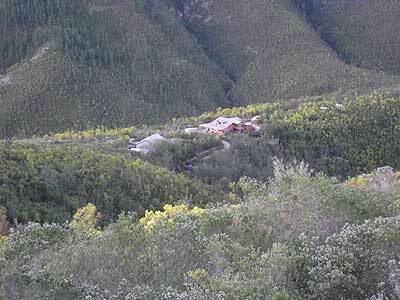 The wooden house, already bearing the patina of weathered age, stretched out along the ridge in front of me. 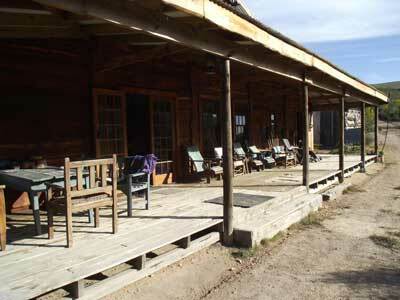 A long veranda running the length of the building (“Western Style”) was fully furnished. Cushioned chairs placed against the walls face the driveway, boarded by a strip of pretty, bird-filled, indigenous garden with a shallow pond. Just beyond the garden, the deep gorge, an offshoot of the Keurbooms River lies some two-hundred meters below; a steep descent we tackled later that week. On the other side of the gorge rose the opposite mountain, even higher than this one, partially blocking the rapidly rising sun. The veranda was in shade but it was still very early. Outeniqua 2 Next….Meet back for the trip home.